Dr O’Mahony managed the launch of the Asthma and Allergy Friendly® Certification Program in North America in cooperation with the Asthma Society of Canada and the Asthma and Allergy Foundation of America. Dr O’Mahony stepped down as President of ASL in 2008 in order to start his family medicine residency program at the University of Western Ontario. He completed his residency program and passed his CCFP exams in 2010. Dr O’Mahony established his own family practice and has been working fulltime in North America since. 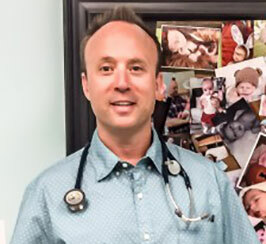 He is an Adjunct Professor of Family Medicine, at the Western Schulich School of Medicine, London, Ontario and enjoys teaching medical students and residents from Western and other medical schools in Canada and Internationally. In addition to his office practice he also delivers babies; cares for his patients in hospital; works in the emergency department; performs minor operative procedures and joint injections in ambulatory care; conducts a newborn circumcision clinic; and is the medical director of Trillium Villa Nursing Home, Sarnia.